When i walked into the PEL AGM it seemed like an ultra simple affair without much hoo-hah, until i looked at the Board. The best of the best were patiently sitting there. Ajay, Swati and Nandini Piramal, Keki Dadiseth, N.Vaghul, and Ramadorai amongst others i couldn’t recognise. Partly intimidating, but mostly gratifying. Despite the big wigs, the attendance was somewhat poor. PEL has gained a lot of negative publicity in the market due to the fact that despite the Rs 572 EPS in 2011, just about Rs 100 has been distributed as dividend till the end of 2014. While that is the public view, i greatly differ from them. The company has changed drastically from 2011 and now seems to have its feet firmly in the ground in terms of direction. Profits, though will follow. Yes, have some faith. The biggest achievement this year, would probably be the clarity that the company will operate only in 3 verticals of Pharmaceuticals, Financial Services and Information Management. None of the regular ratios used for analysis are applicable here, but these statements made by Ajay Piramal hold a lot more weight. The company will only borrow to lend as the company is able to borrow at about 10.25% and get about 16-17% return. Foreign loans that have been borrowed to fund DRG acquisition will not be retired as they cost the company between 5-6.5% only. Pharma businesses will turn cash positive this year. DRG investment has improved sales but will turn cash positive only in 2016 or later. Neuraceq and BST-CarGel will begin to bring in money this year. 1 molecule will be leased to a Global Pharma company for exploitation in 15-16. OTC will continue to acquire products as and when they are good fit at a good valuation. 14-15 will probably be the last year of pain and 15-16 should see a lot of triggers bringing in the money. Money will be pumped into research and only if no returns are achieved by 2016, the company will stop the research. There are no commitments in research and the plug can be pulled whenever the company wants to. Shriram Transport Finance as well as Shriram City Union Finance have doubled in the last one year. Due to the dollar appreciation the DRG investment is about 20% cheaper. Equal and Caladryl are excellent for the companies product portfolio. Alliances with CPPIB, IIFL will go a long way in the future. IndiaREIT has made some bad investments in the past and the company is on the job to get out of them a.s.a.p, however the funds under Khushru Jijina are performing well. Pharmaceutical business grew at 14%, Critical Care at 17%, OTC at 21%. SIG has been making investments and has already invested 925 cr. While a Balance Sheet of a company that is in the process of metamorphosis is of little relevance, two fields particularly give me a sense of discomfort. The recognition and depreciation of Intagible assets and Goodwill on consolidation. I wish there was more clarity on this by the company in terms of its accounting policies an depreciation policies. Neuraceq is a bankable trigger and this year will be exciting on account of this. Understanding PEL is not easy as the most important ingredient to understand this company is faith. One can get a zillion doubts at the turn of every page in the AR. One has to judge this company based on spirit and not numbers for a little while longer. This company is a rough diamond in the hands of and expert polisher. No scientific explanation can guarantee that this too will be a stunning diamond. I’m going to trust my gut on this one for a little longer. I happened to discover your blog today !! I am invested in PEL since 2010 and enjoyed the dividends..in fact i added the stock with the conviction that i will be able to clock 15 % pa returns and i am happy for the same.. Your analysis is thought provoking and made excellent projection of things to come..
the recent descision of PEL to stop early stage research..is in line with what u suggested ..I am wondering how the results of Q2 will be like.. with accruals from REIT and finance arms will they report + net profit ? last sept they reported minus 30 crores !! when are they going to consolidate their reporting and what about tieups with FORIEN PENSION FUNDS.? Satish, first off congratulations on picking up PEL at the most opportune time. Like i had mentioned in my blog earlier, this stock needs a lot of faith at the moment and its cannot be measured quarter to quarter, for the moment at least. All that you have to keep an eye for is whether things are moving in the right direction. I fell they are, although i would love more clarity on the information business. 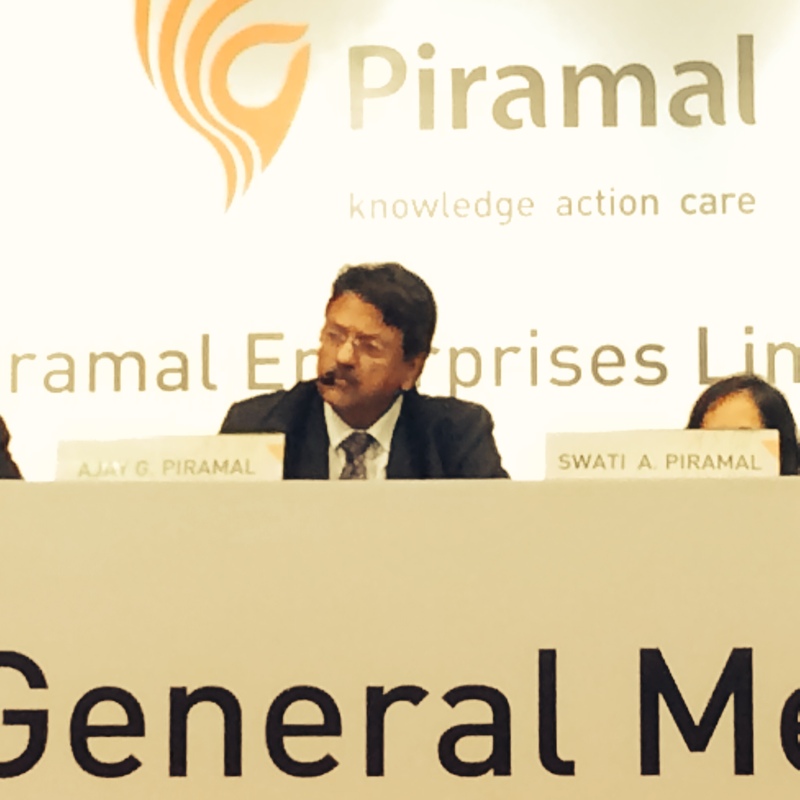 Piramal has been able to invest wisely and has also earned himself an awesome reputation amongst the foreigners. Check out the book “Re-imaging India”, by McKinsey, and look up pg no 135, by Miles White the CEO of Abbot India, he confesses that people think that he may have paid a bit too much, but he is glad he did it. Piramal has thus ridden on this goodwill to get himself a nice cushy kitty when almost NO ONE was optimistic about India, with few exceptions like Mr.Modi. I have also invested in a scheme by India REIT and the latest valuation said that the NAV is up by 2.47 times, and i spoke with people in the REIT and they say that their handwork in the last few years couldn’t have been met with better luck. So hold on and let them take their time to consolidate. As for you, it gives you more time to pick up more stock in the next market correction. Thanks for your precious comments !! AP’s prudence and reasons for selling / investing in bussiness is phenominal !! As an serving defence pers about to retire in two years from now i wish to go along with PEL as long as possible !! What impresses me is AP’s prudence,simplicity and integrity.. rare qualities in bussinessmen of our Country .. other entities I am invested for similar reasons are Sundaram gp (IMPAL) and H A Mafatlal gp ! I will keep intouch through this very informative blog !! KINDLY GO THROUGH THE INTERVIEW .. Your take on todays result esp wrt info mgmt and one time write offs!. Another oppurtunity to buy !! There is no point in analysing this quarters reaults. We may have a little quality at the end of the year and it probably will start showing some clarity by this time next year. I would not bother trying to look too much into it as piramal is generally tight fisted about the information he lets out. What is the implication of note 5 (v) of standalone results for q3 ?Your veiws please ! Assume A owns B, and B owns C, C is known as a step-down subsidiary of A. What Piramal did was amalgamated C into A. The over all impact should logically be the same but it is usually done with a specify purpose in mind. What that specific purpose is, I don’t know. I don’ t think that there would be any impact due to this but would only increase ease of operations for the company or ease of reading for the investors.